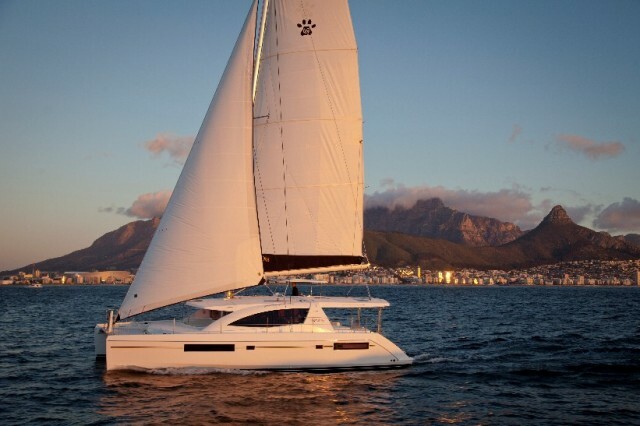 The new South African Leopard 50 Fly catamaran fills out the builder's line with a roar for 2018. There's nothing small or even vaguely uncomfortable about Robertson and Caine's new 50-foot cat. Introduced at the Miami boat show this year, this Leopard gives 50-feet a whole new dimension and show goers took notice. 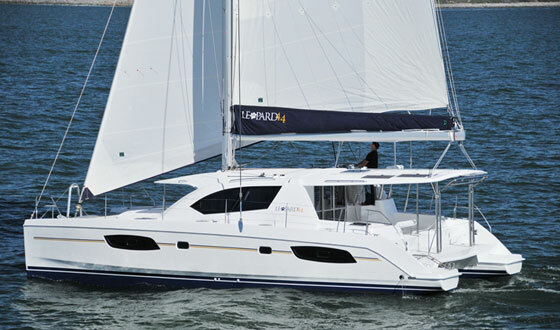 The Leopard 50 replaces her 48-foot predecessor and highlights some of the now-familiar aesthetics introduced by the 40 and 45 a few years ago. With her multiple social areas, refined ergonomics, evolved profile and a more open feel, she's sure to be a crowd-pleaser, especially in charter. 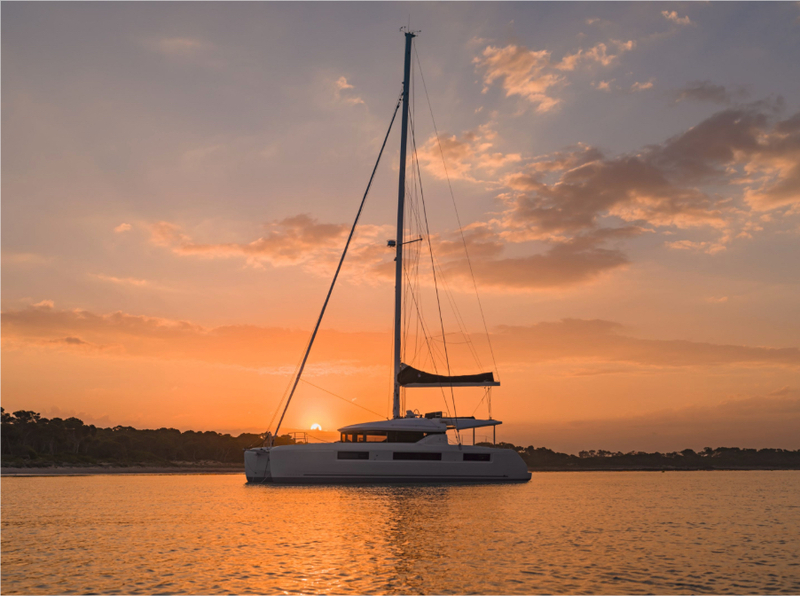 Replacing the 48, the Leopard 50 is offered in a hardtop or flybridge model—both providing very different experiences for those at the helm. 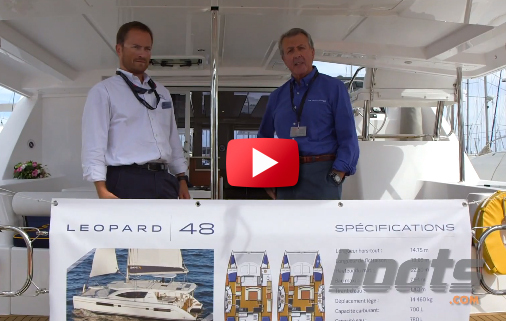 The Leopard 50 comes in two flavors—as the classic hardtop (50P) and a flybridge model (50L). 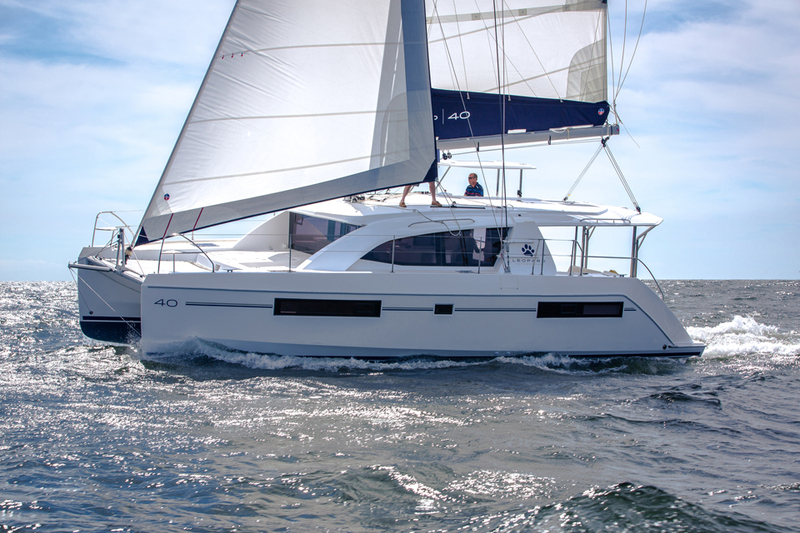 The 50P may be outfitted for performance cruising with a fathead and deeper mainsail. The flybridge version will be a hit with anyone looking to accommodate large parties that like to spread out. Leopard took a different approach with the design of the flybridge by separating the helm station from the rest of the social space, dedicating room to the driver and her companion but still keeping them within earshot of the party. A hardtop protects the skipper but an integrated skylight allows for visual checks on the mainsail. Visibility to the four corners isn't bad: you can see both bows when you stand on the steps near the winches. 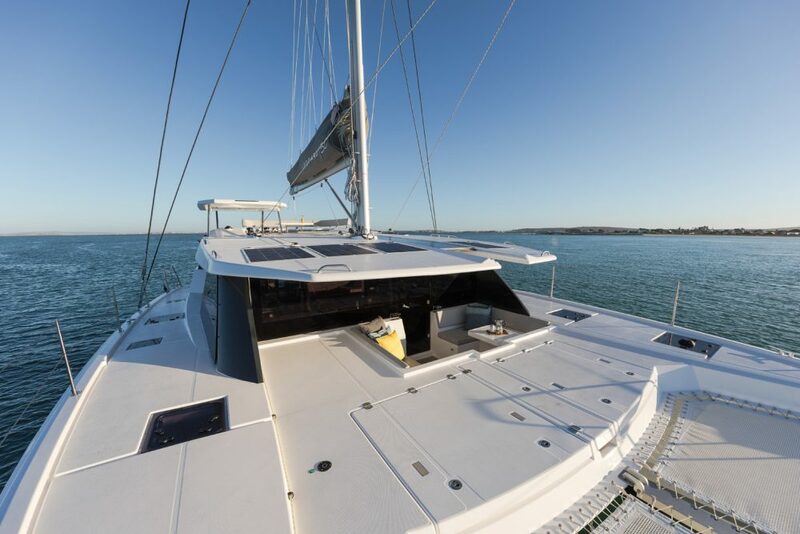 A dip below the hardtop affords a line of sight to the port transom and stepping out onto the side deck provides an unobstructed view of the starboard quarter so backing into a slip shouldn't be too tricky. Solid steps lead up to the flybridge from the helm but there's also access from here to the side deck if the skipper needs to help with docklines or anchoring. Four separate floating steps lead up from the side deck to the fly settee with a center cocktail table and a sunpad on the coachroof just ahead. For sunset views with cocktails, this will be the best seat in the house. There's no shortage of space in the cockpit, which can seat eight for a dinner party while two more lounge across the way on a starboard seat. Naval architects Simonis & Voogd created an angular cat both inside and out. The 50 has nearly plumb bows for a longer waterline, hard chines down low to keep spray off the decks, and wider but lower, squared-off transom steps that are easier to maneuver from the dock or dinghy. The engine rooms are just below theses steps with good access to twin 57 HP Yanmar diesels and with 243 gallons fuel, this is a go-far cat. The cockpit is enormous and will seat a dinner party for eight at the port side table while two more can lounge across on the starboard seat. When the hydraulic swim platform (that also carries the tender) is lowered, you can walk all the way across the beam without ever needing to step up into the cockpit. 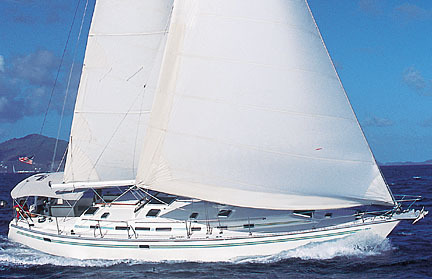 The sailing is easy with a large full-roach mainsail and a slightly overlapping jib that together total 1,660 square feet of canvas. 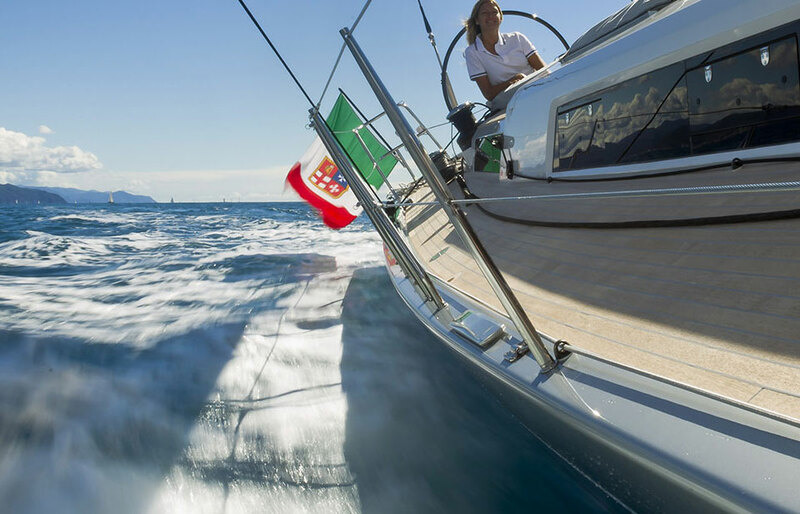 For downwind work, a Code 0 on a furler would be ideal. 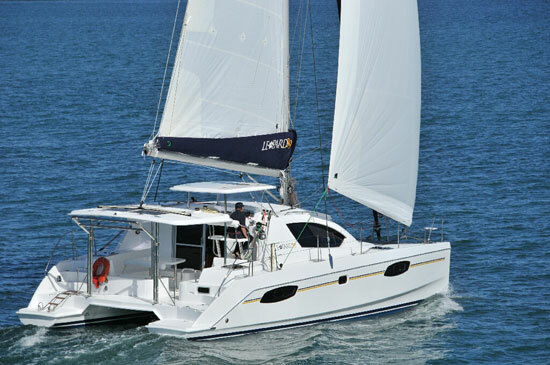 The Leopard 50 is flexible with multiple layouts, including 3-5 cabins and 4-5 heads—which will easily accommodate 13 in a pitch if an owner opts for five cabins. 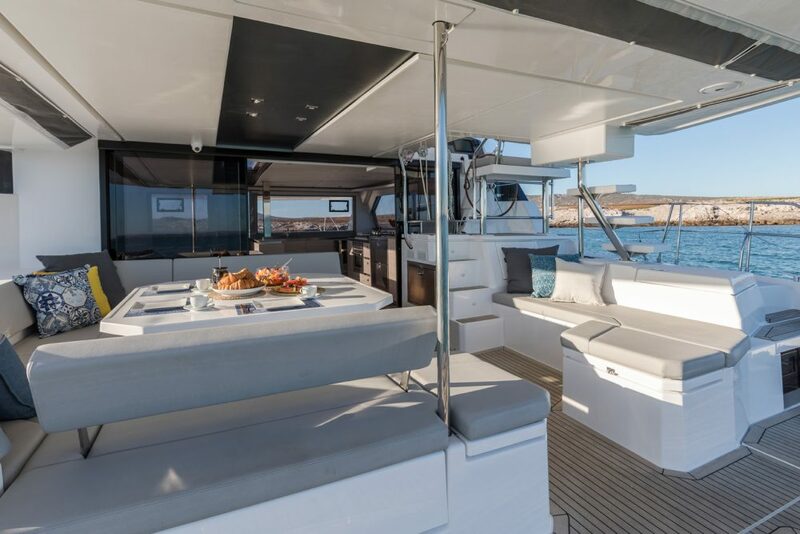 Inside, the Leopard 50 resembles her siblings, the 40 and 45, but neither can match her voluminous hulls and versatile configuration. The layout includes 3-5 cabins (plus an optional skipper's cabin in the port bow) and 4-5 heads. 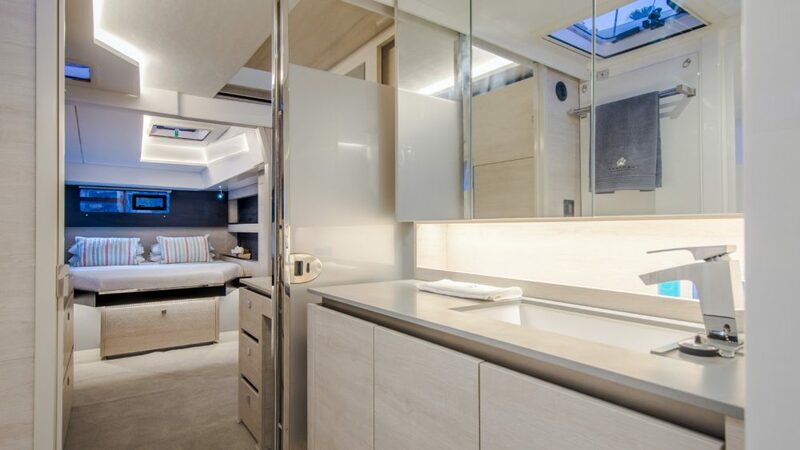 The owner's suite is tucked aft into the starboard hull but because there's so much volume to work with, there's still room for a guest cabin forward on the same side. This differs from other brands that dedicate an entire hull to the owner's cabin, which in this case, seems truly unnecessary. Each starboard cabin has its own staircase down from the galley for maximum privacy and the owners will lack for nothing including a sumptuous head and a dedicated desk/vanity. Meanwhile, the port hull has the option of a cabin aft with an office or workshop forward and two heads amidships, or two cabins fore and aft with en suites. On the main deck, the galley has moved forward and to starboard with the U-shaped settee aft and to port. As on the smaller models, the cockpit and interior settees sit back-to-back for better conversation flow and more integration between the outside and the inside. The dinette table folds out for meals. It can also fold up to smaller dimensions and be lowered for cocktails or to simply stay out of the way, providing more room for multiple people to move about in the saloon. The nav desk that looked like an afterthought on the 40 has grown into itself and has become a real and functional navigation station with room for instruments, an autopilot control and multiple USB ports for charging personal electronics. The desktop is large enough to accommodate paper charts and there is drawer stowage for the ship's necessities. The swoopy side windows of the 48 are gone, replaced by numerous angular ports that provide 360-degree views even from a seated position. The panorama is enhanced by the large, flat, forward window as well as the watertight door that leads to the forward cockpit. This forward exterior social space isn't new but in this version it gained acreage with an L-shaped seat and table to port and another settee to starboard. The hard section of theforedeck grew as well and now has an enormous sunpad that can conservatively accommodate six. The cushions are attached to the lids of two lockers, which house the genset and water tanks. For the purists, there is still a bit of trampoline forward of the pad for over-the-water lounging. One of the lovely things about the forward cockpit is that you can open the forward and aft doors upon returning from shore on a hot day and cool the boat down in just a minute or two. Inside, a rectangular fixed skylight also lightens up the interior with Ocean Air sliding blinds providing shade when needed. Grey Corian countertops complement the stainless steel refrigerator drawers and the grey/beige cabinetry. It's a clean aesthetic that permeates the whole Leopard line. It's minimalist but never stark. The 50 will sleep 13 in a pinch between the five cabins, the convertible saloon settee and the skipper's cabin but that's about five too many for my taste. I'd stick with three or four cabins to really get the appeal of this big boat with all its versatile spaces dedicated to guest separation and privacy. Leopard has launched nearly 2,000 units so they have a depth of experience thanks to plentiful owner and dealer feedback. Another plus is that boaters can test these workhorse models in charter with the Moorings before buying one for themselves. 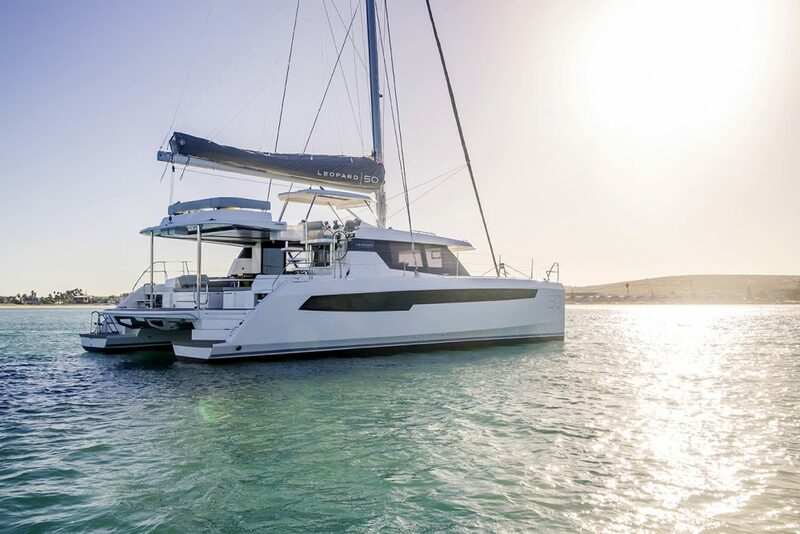 Once you've lived with a cat for a week on charter, you'll know it's strengths and shortcomings and you'll identify exactly the layout that would be best for you and your family. If a big cat purchase is something you're contemplating, consider spending a lovely vacation on one of these and then be sure to put the Leopard 50 on your shortlist. Sail area 1,660 sq. ft.